Two people with Ebola triggers mass hysteria in the markets, but a Dr. in NYC and others (potentially) with the virus resulted in a mere pause in the buying. Recent trade in the equity and bond markets are a perfect example of just how irrational markets can be. Further, that market prices are driven by emotion and margin motivation far more than logic. The same news that lured investors to sell their holdings last week (Ebola) are being ignored this week despite being a considerable bigger threat. With that said, we've always looked at Ebola as the market's excuse to correct rather than a true threat to GDP. We had been in the camp that the equity market "needed" a good correction, and that Treasuries "needed" a good short squeeze. Both finally came to pass, but emotion took things a little further than we had anticipated. Nonetheless, now that we've seen these two events we believe the intermediate term extremes have been made (high in Treasuries and low in equities). 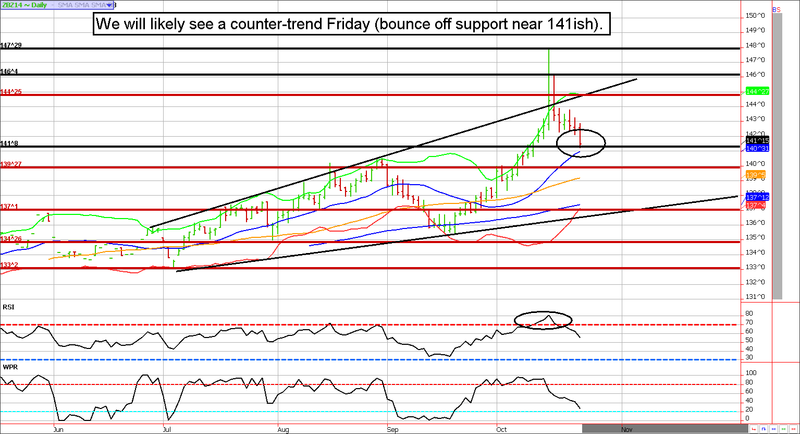 Treasuries are weak, but Friday's tend to be counter-trend...can we get some back and filling? Bonds and notes have moved swiftly lower following last Wednesday's historical rally. In our view, this will continue to be the case in the coming months. Nonetheless, the long bond is near support and we are going into the day of the week that has a relatively high probability of seeing counter-trend trade. New home sales, due to be released tomorrow morning at 8:30 am Eastern, are anticipated to be on the weak side. Perhaps that will be the catalyst the market will need to get a bit of a bounce off of support (near 141). **Consensus:** We believe the highs in this complex are likely in, but the Fed meeting could trigger a short-lived rally. Look for support near 141 and resistance near 144'25. Ironically, bull market runs typically start as short covering and profit taking by the bears; eventually they progress into panicked buying as the bears with poor timing scramble to get flat. Next comes the bulls that were squeezed out on the lows; they often want back into the markets at all costs...thus, price isn't an issue. The result is a massive one-way rally; exactly what we are seeing now. Generally, once this phenomenon gets started it can be difficult to stop. Typically, the big daily gains transform into a slow grind higher but the overall direction is often up. This is particularly true as we head into the holidays (which come with thinner volume). We realize it is a little early to be talking about holiday rallies, but the chart looks like Santa could be coming early this year. We wouldn't be willing to get bearish this market until well over 2000 in the ES. For now, the short squeeze will likely continue. There were a lot of bears looking for a repeat of 2008 (or the 2010 flash crash) that have been thrown to the wolves. Although we like the upside, keep in mind that tomorrow could see some back and filling (Friday's are known for that). Markets tend to go down faster than they go up, but they trend better on the way up. As the S&P was falling last week, there were substantial "bear market bounces" in which 10 to 15 handle rallies would emerge, then eventually succumb to selling pressure. However, the three day rally in the equity markets has been a one-way-street. Aside from a few brief back and fill moments, the price action has been dominated by buyers. Unfortunately, we highly doubt the buyers are willing; instead, most of the buying is likely the result of short squeezing (those that sold at what they now know to be bad prices, are forced to buy back their contracts to stop the bleeding). Keep in mind that the equity markets have a very strong tendency to rally into FOMC meetings (next week), so any short term selling could be temporary (but that doesn't mean it can't be deep...traders must be prepared for just about anything in volatile markets). **Consensus:** This might be too far too fast, but it probably won't matter. The markets tend to rally into the Fed, and the momentum is clearly higher. We wouldn't be willing to consider getting bearish until prices see well above 2000 in the ES. Buy Levels: 1935 (minor), 1917, and 1905. June 12 - Buy September mini corn futures near 440. July 8 - Add on to mini corn scale trade. August 19 - Add to the mini corn and wheat scale trades by purchasing December mini futures contracts. August 21 - Sell a December DX futures contract and buy an October 83 call for about $300. The total risk on the trade should be about $1,000 before commission (depending on your fill prices). The profit potential is theoretically unlimited. August 26 - Roll September mini grains (wheat and corn) into December contracts to give the market more time to recover. September 4 - Sell October DX 83 call to lock in a profit of about $700 before transaction costs. The futures portion of this trade is underwater, we are hoping for a reversal in the coming week or so. September 9 - Sell November Euro 133 calls and 125 puts for about 65 ticks ($812.50). September 10 - Sell December crude oil 82/98 strangles for about $1.10 ($1,100). September 24 - Buy back the November Euro 133 call to lock in a profit. September 24 - We've reached our pain threshold in the dollar, let's exit the DX and go to the option market. We recommend selling double the quantity of the December Euro 123.50 puts and the 132 calls for about $800 per strangle. September 29 - Buy back the December crude oil 82 puts to lock in a profit of $370 to $400 per contract, and replace them with short 86 puts. This brings in more premium and rebalances the trade. October 2 - Buy back November Euro 125 puts at a small loss (combined with call you should be slightly ahead, or at least breaking even on this venture after commissions). October 2 - We made a big mistake rolling our 82 puts higher. Let's rebalance the trade and look for volatility to decline by offsetting the existing strangle and selling the December 95/82.50 strangle. October 9 - Buy back 95 crude oil calls to lock in gain on that side of the trade. October 10 - Sell December crude oil 92 calls for about 60 cents to hedge the 82.50 puts. October 14 - Sell December bond 147 calls for about 30 ticks. October 15 - Roll the December crude strangles into a January 70/90 strangle AND a December 74/88 strangle. October 15 - We were clearly a day early on this one, roll into December 151/142 strangles. October 17 - Buy back December bond strangles and sell 140/146 strangles to restructure the trade. October 22 - Buy back December crude strangles to lock in profit of about $1,000 (this goes toward the premium lost on the 82.50 put).